One week ago, tomorrow, the last brand new (no other owner) Saab 9-5 Sedan was delivered from ANA Trollhättan to a man who never owned any other brand. 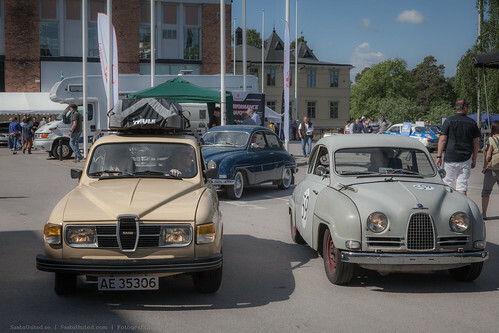 55 years ago he bought his first Saab and has since then a new one, almost every year. Let me introduce you to Göran Danielsson. Now, owner of total 42 Saabs thru his 55 years of only Saabs. He lives just outside Gothenburg with his wife and he used to work as a auto-journalist. Back in the days you had to own your own car, if it was needed for work and thru all these years he never ever thought of buying any another brand than Saab. The 9-5 he bought this time was built in the Saab Factory, and not at ANA as a few of the very last Saabs were. Göran and his wife drives home with a 9-5 Vector 166hp diesel and equipped with almost everything you can get in a Saab. Only thing missing is the moon-roof. ANA Trollhättan CEO, Joachim Lind stresses the question: Has anyone else ever owned 42 Saabs thru 55 years? Can anyone beat that? When you order stuff (?) online, there is sometimes a comment box at the end before you hit the order button.